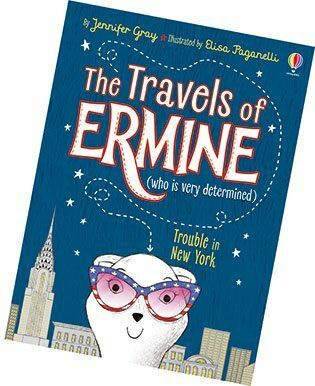 Win The Travels of Ermine: Trouble in New York books! Fancy a scooping a copy of the brilliant new book The Travels of Ermine: Trouble in New York – and a super scrapbook, too?! In the first book from the new series by awesome author Jennifer Gray and illustrator Elisa Paganelli, Ermine sets out to explore New York City. Equipped with her scrapbook, passport, toolkit and feathered hat (of course! ), she can’t wait to see all the cool sites! But when her suitcase is switched by mistake, Ermine’s adventure takes an unexpected turn – and our fabulously furry traveller finds some dangerous robbers hot on her tail…! One lucky winner will bag a signed copy of The Travels of Ermine: Trouble in New York and a cool scrapbook to record all their awesome adventures! Two runners up will scoop a copy of this fab new read. Yay! Click HERE to find out more about Ermine’s epic adventure around New York!